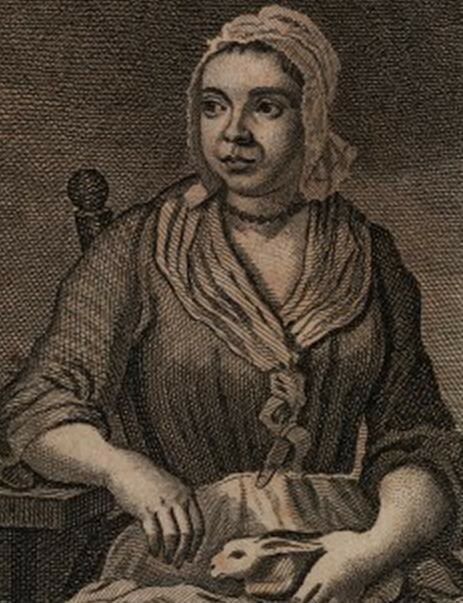 Mary Toft was 23 when she gave birth to her first rabbit. Other rabbits — six, seven, eight of them — followed. It was 1726. Toft lived in Godalming, a small rural town in Surrey; news of the births skipped its way to London, and the king’s anatomist was dispatched to investigate. He was unimpressed with Mary, describing her as “of a very stupid and sullen Temper.” Nevertheless, after witnessing a rabbit birth himself — the 15th! — he returned to London convinced of the extraordinary, preternatural nature of the births. (And why not, amazing things happen to stupid country people all the time: they’re sold magic beans, they haul talking fish out of the water, they give birth to rabbits.) This was in November. By the end of December, the entire thing was revealed as a hoax. Mary was charged as a “Notorious and Vile Cheat” and sent to Bridewell. We make history bloodless. If you’ve heard of Mary Toft, you may not have given much thought to the mechanics of how such a hoax might work. I certainly hadn’t. A woman reclines on some low couch, her rabbit progeny snuffling and hopping on the floor around her. How did they get there? Well, as a magician produces a rabbit from a hat, so Toft might have whisked these rabbits using some sleight-of-hand from under the skirt of her gown. Voila, one baby rabbit and here, another and another, until boom, a litter! But, if you give it even two seconds’ thought, you know that would never work. Would it? Of course it wouldn’t. A little about Mary Toft. She was married; her husband Joshua was a year older than herself. When the two concocted the plan, they’d had three children together (one child died in infancy). Only that August, Mary had suffered a miscarriage. The pregnancy was six months along. They were poor. He was a journeyman cloth-worker, then a dying trade, she worked in the hop fields. Whatever modest cottage you’re picturing them in, half it. Then half it again. Take out a few of the windows. Now add in more people, not forgetting the two young kids: A mother-in-law (not living there but a frequent visitor) and a sister-in-law (ditto) and neighbors and friends, all in and out, all the time. One problem with that original view of Mary presents itself: It seems doubtful that she ever got much time to recline tranquilly on a low couch. There were a boneless girl, only eighteen inches tall, who had seven sets of teeth; a mermaid; a mother and daughter, both with three breasts each; a man with one head and two bodies, and a woman with one body and two heads; a boy with a live bear growing out of his back; a young man from Suffolk whose body was covered with bristles like a hedgehog’s; and a little Dutch boy who was born with the words “Deus meus” inscribed on his right iris, “Elohim” (in Hebrew characters) on his left. Mary also might have expected a pension from the king for her troubles. Earlier that same year, Peter the Wild Boy, a feral boy discovered in a forest in Germany, had been brought to George I’s court, given a green velvet suit with scarlet stockings, a tutor, and etiquette lessons on how to kiss ladies’ hands. Later, he was pensioned off to a family in the country, having proven untutorable. What he thought of the fine suit is unrecorded, though it’s said that the first time he witnessed a man taking off a pair of socks he screamed because he thought the man was peeling off his skin. Undertaking a hoax must be similar to embarking on any other creative project: In the beginning perfection seems possible, a destination you might reach by keeping to a direct, straight line. There are the mountains, all you have to do is walk toward them. You don’t anticipate bogs, lost paths, misjudgment of distance, your own willingness, at a certain point, to seize on any passing promontory and say, “Close enough.” I don’t know what Mary Toft thought — she couldn’t read or write and leave a record for herself, and her confessions were taken down under duress and are entertainingly unreliable — but I imagine her as feeling very optimistic and larkish at this early stage. What would she have to do? Lie around her bed and do a little playacting? Gab with friends and neighbors while waiting for a doctor to come around and certify “this rabbit is indeed a freakish birth, send word to the King”? Compared to working in the fields, it must have sounded positively restful. I doubt any of this business embarrassed Mary very much; nothing in the records suggests she was remotely shy. What she may not have counted on is how painful it would be. Not all of the doctors who came to examine her were trained at midwifery or adept at examination. (Also, two words: rabbit skull. Parentheses are used here to confine the harrowingness of it.) And the process made her extremely ill, too. In December, when she gave her confession, she was feverish and suffering convulsions. She also had this odd skill. She could make the muscles of her stomach contract and jump, in a stagey counterfeit of labor. When needed she could keep this up for hours at a time. These contractions (which came to be known as “leapings” and “jumpings”) were, by all accounts, extremely dramatic to behold and helped convince many onlookers that Mary’s uterus was bristling with baby rabbits. The very first rabbit that Mary Toft gave birth to was, in point of fact, a cat. The schemers didn’t settle on rabbits until a little further along — in the beginning, they were only thinking “monster” (broad strokes! big picture!). And so on 27 September, the Tofts cut up a cat, took out its guts and liver, inserted into its intestines the backbone of an eel they had eaten for dinner the previous Sunday, placed the concoction in Mary Toft, and left her alone in the house. She then sent for a neighbor, Mary Gill, complained that she was in great pain, feigned a brief labor, and let her friend hear the monster fall into a pot. A cloud of awkwardness and mild stage fright hangs over this scene. The neighbor was asked to fetch Mary’s mother-in-law, who had probably only just returned to her own home after helping to insert the cat-and-eel bundle. She doubled back. Then the husband Joshua came along, who knew this was a hoax, and other neighbors were called in, who did not, and everyone milled around wondering what to do with the gruesome monster-in-the-pot, until it was decided that Joshua should take it to a surgeon who practiced midwifery in the nearby town of Guildford. This was Dr. Howard. Here is how it went: The pot is presented to him at his home. He peers in, seems unimpressed (as well he might have been). Suggests he might be more impressed if the monster in the pot had a head. Joshua withdraws with the pot and returns to Godalming. Intermission of a few weeks while the players consider their next move. Some decision is reached, and Howard is called to attend Mary Toft at her home. Alas, in the intervening time, the cat’s head has been misplaced as has one of its feet. (The cottage is small but not so small that you can’t lose a cat head in there.) The head of a rabbit and a rabbit’s foot are substituted, and Howard, delivering them shortly thereafter, is convinced of the Tofts’ claims. Assembly of the various parts, and there it is for all to see: A rabbit-cat monster with the spine of an eel! In your face, boy with a live bear growing out of your back. After that first creature, it was nothing but rabbits for Mary Toft. The surgeon Howard was soon delivering them at a pace of nearly one per day, preserving the bodies in alcohol. Mary relocated from Godalming to a lodging near his Guildford house to make it easier for him to attend her. Her sister-in-law Margaret came along as an “attendant” (and, of course, as covert rabbit point-man). The letters had their intended effect. Word spread and soon thereafter — fatefully — Nathanael St. André, the Swiss-born, 40-something “Surgeon and Anatomist to the Royal Household,” arrived on the scene. First lucky break for Mary: St. André was a tremendous self-promoter. Had Mary not managed to produce a rabbit for him, you get a sense he would have pushed one out himself, then galloped back to London to take out a full-page advertisement announcing the medical dazzlement of same. But she did manage it, and so he was not obliged. Second lucky break for Mary: He was a terrible doctor. (His detractors claimed he’d only gained his post because he spoke German, useful in George’s court.) His examination of Mary was cursory and inexpert. Later he would be ridiculed for having deduced, from an external touch to her belly, that the rabbits were being bred in her right fallopian tube. It was St. André who described Toft as “very stupid and sullen.” And she may have been. Or, she, provincial, may have disliked his foreignness, the striving manners that had gotten him to court. They were also each about to use the other; and it is offensive to us, when seeing another as a means to an end, to realize that they are viewing us in the exact same light. Either/or/and. Finally: this was the fifteenth rabbit. The fifteenth! It’s possible that somewhere in here — as she was moved to strange lodgings, confined indoors, under constant observation by a nurse and attendants, rumbling the bed for hours, and with a bunny always hooked midmast — that Mary Toft began to think this scheme was not so fun after all. But what did it matter if neither liked the other? Their reputations were now entwined. When Mary Toft fell, it was St. André who fell hardest with her. But neither yet knew this would happen. With his visit, the hoax reached its pinnacle: The bait was taken, the King’s fish was on the hook and happy to be there — had in fact leapt out of the water to be there. St. André returned to London with some of the preserved rabbits for dissection. The findings were puzzling. For example, some of the rabbits were larger, heftier, almost as if they weren’t fetuses at all, but a few months old. Yet other rabbit specimens had the small, undeveloped lungs and intestines of a fetus. Huh. St. André waved away the inconsistencies. Such “animals were of a particular kind, and not bred in a Natural Way.” How could they be expected to display natural characteristics? Up till now we’ve had 15 rabbits and two doctors. At this point that ratio reverses itself. Doctors from London start springing up everywhere and the rabbits take to staying stubbornly, frustratingly out of view. One rabbit keeps up a forceful leaping and darting in Mary’s belly, leading Howard to promise the visitors, ever more impatient, that another birth is imminent. But this rabbit seems content to remain where he is, racing endlessly in circles. With every new spectator, the hoax gets a little more difficult and more complicated to maneuver. There are two points when something begins to careen out of control like that: the point where you think you might still regain control of it, and the point where you realize no, no, you will not. This observation of Mary comes at what I judge as the first point, where she was clearly hoping that, despite the increased scrutiny, she might still bring the whole thing off. “I observ’d her with some Attention, as she was walking about the Room, and found that she press’d her Knees and Thighs close together, as if she was afraid something might drop down, which she did not care to lose.” This note came from a doctor who was sure of the hoax even before leaving London. He pretended otherwise with Mary, though, and was favored with the opportunity to deliver the hindquarters of a rabbit. Inspecting the specimen later, he identified that the muscles had been cut cleanly by a knife. Now there were two pincers: The doctors who were convinced this was a hoax, and the doctors — Howard and St. André — who had quite publically staked their reputations that it was not. Mary Toft was caught between, still center stage, but no longer controlling what happened. On November 29th, against her wishes, she was brought to London and set up in a bathhouse near St. André’s residence and the King’s castle. London wanted a rabbit. 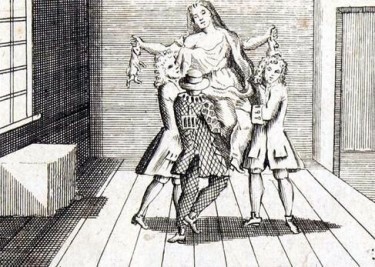 The hallways outside Mary Toft’s room were jammed with crowds: learned gentlemen and physicians, along with court cream puffs and meringues, the idly curious and the jadedly titillated. Anyone with any kind of influence at all was there to gawk. Outside the rooms a furious maneuvering was going on among the doctors to buttonhole public opinion. In the rooms: Mary Toft labored and labored but failed to produce the elusive 18th rabbit that London awaited. Mary was now very sick with fever. She must also have been quite desperate. With the move to London, she and her sister-in-law Margaret had been severed from their steady Surrey supply of rabbits. How to procure one, and then how to rustle it up the whibbob with all of George’s court squinting at you everywhere you go: These were the difficulties brought by bringing country matters in the city. Reading this I felt some disappointment for Mary in the quality of her confederates. And surely Joshua doesn’t come across as the most cunning co-conspirator one could wish for. There’s something great and expansive, though, about his movements here — as if he saw the entire countryside as a backstage area, which he could roam and get props from and exchange bits of unguarded conversation with people. If you’re putting on a play, you don’t expect the audience to leave their seats and come rummage around your prop table. On December 4th, in London, the pressure started in earnest to make Mary Toft admit her fraud. On December 6th, she was told that if she didn’t confess, one of the doctors would be forced to “try a very painful Experiment on her” to discover the mysterious biological mechanism enabling the rabbit-births. On December 7th, she confessed. History itself can seem like a sort of country province, a distant place of quaint stupid people who will believe anything. As opposed to our modern day, where doctors are never inept, the human body’s possible conditions are agreed upon by all, and we all detect blatant impossibilities in an instant. 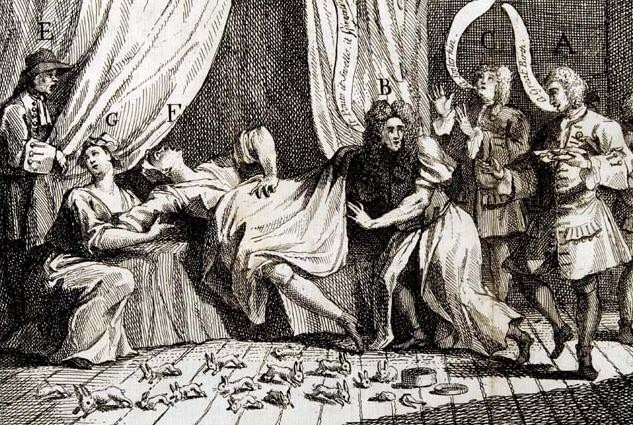 Why did so many people believe that Mary Toft gave birth to rabbits? One reason was they were prepared to believe in unusual births, because of a theory, then widely held, that the experiences a pregnant woman had could imprint themselves in literal ways on her fetus. So Joseph Merrick, the Elephant Man, a full century after Toft, explained his deformity as having been caused by his mother being trampled by a fairground elephant when she was pregnant with him. This part of the story was, in its own way, also true. She chased, she longed. She could not catch what she desired.